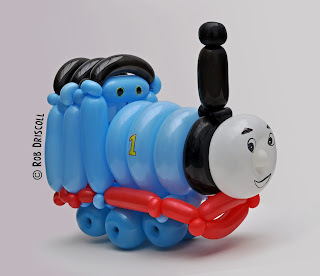 Its Philip's birthday today, he is my nephew and earlier in the year he requested a Thomas the Tank Engine, I did make a more simple Thomas back on March 20th but I wanted to do a more complicated one today. I hope you have a very happy birthday Phil. This Thomas is made from 13 balloons, I started with the face which is a 5" round and a bit of white balloon for the nose, I then added an inner core (which you cant see) from a 350, the main tank and funnel were next, they are a 260 and a 160 and then cane the red 160s around the base, the cab and roof came next and finally I added the wheels and artwork on the face.